In AD 395, the Roman Empire was permanently split into two halves, and although the eastern half—called Byzantium by historians—faired well, the western portion fell less than a century later when it was overcome by “barbarian hordes.” During that period, a series of Germanic migrations and invasions simply overwhelmed Rome’s capacity to fight off invaders and assimilate new peoples. 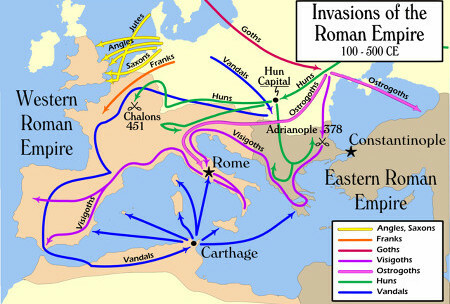 “Barbarian” Invasions of the Roman Empire, AD 100–500. The “barbarians” as they are collectively called, were semi-nomadic tribes that roamed and controlled various parts of Europe at different times. Despite their unflattering appellation, the Visigoths, Ostrogoths, Franks, Lombards, and Anglo-Saxons were not uncivilized, and their jewelry and art provide ample evidence of this fact. 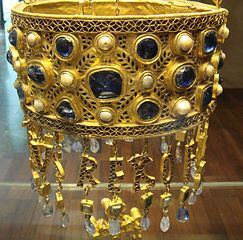 Throughout the history of the Roman Empire, gemstones served a variety of official, ornamental, and talismanic purposes. 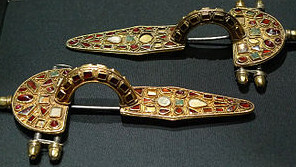 Although the Romans had a high regard for garnets, their use greatly expanded during what is known as the Period of Barbarian Invasions, or the Migration Period (c. AD 300–700). During that time garnets were used extensively in jewelry and traded throughout Europe and Central Asia by various peoples. Most barbarian jewelry was practical in nature. It was frequently associated with clothing and represented by fibulae—brooch-like fasteners that served as safety pins, shoulder clasps, and cloak pins. However purely decorative objects such as necklaces, armbands, and earrings are also known. One of the key elements in the jewelry of this period is the heavy use of garnets in cloisonné settings that resemble stained glass. Goldsmiths worked in a number of different techniques, including repoussé, filigree, granulation, and enameling. Cameos and intaglios inherited from the Romans were used a great deal in barbarian jewelry, including many fashioned from garnets. The well-formed image of a lion, if engraved on a garnet, will protect and preserve honors and health, cures the wearer of all diseases, brings him honors, and guards him from all perils in traveling. During this period, soldiers were known to wear garnets for decoration and protection. Garnets were set into belt buckles, sword hilts, and shields to ensure victory and to prevent mortal injury on the battlefield. One group of barbarians, the Huns, migrated into Europe around AD 370 and set up a large empire. 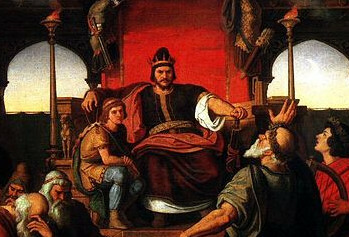 During his reign (AD 434–453), Attila the Hun ruled an empire that stretched from Germany to the Ural River and from the Danube River to the Baltic Sea. To some Attila was a noble and able ruler, but to others he was the quintessential barbarian. 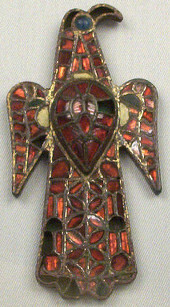 Garnet Shoulder Clasp from Sixth Century Burial at Sutton Hoo. The clasps secured the two halves of a cuirass, or chest armor. 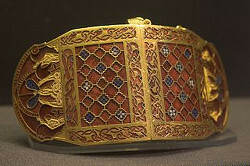 Attila wore a garnet armband for protection during his campaigns. According to legend it was only after he lost this piece of jewelry—sometime in AD 451—that the pace of his conquests began to slow. 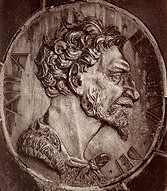 After invading Italy in AD 452, he decided not to push toward Rome but instead returned to his palace across the Danube, where he died shortly thereafter.